1. The most recent ONS statistics show that there are an estimated 7.1 million non-UK born people resident in the UK of whom 6.6 million or 93% live in England; they comprise 13% of the population. 2. By contrast, in Scotland there are only an estimated 326,000 foreign born migrants who make up 6% of the Scottish population. The population density of Scotland is only one sixth that of England. 3. The figures for Wales and Northern Ireland are even lower at 150,000 and 100,000 foreign born respectively. 4. The ONS projects that the population of the UK will have increased by 5 million due to immigration in 16 years’ time. 4.3 million (86%) of this increase is projected to go to England. 5. 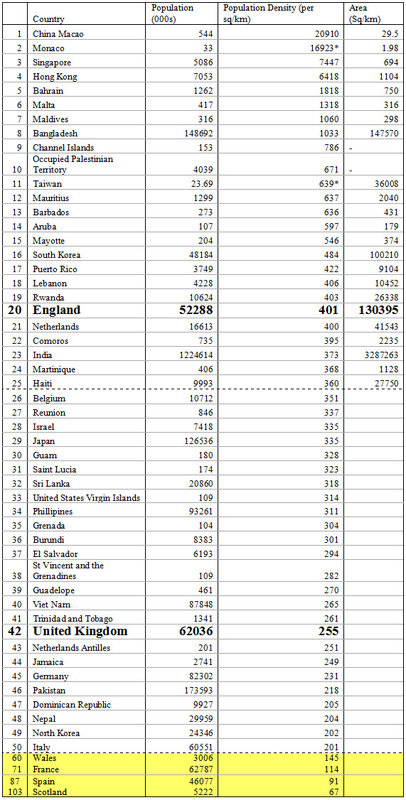 This is why, when looking at immigration and overcrowding, the relevant country is England and not the UK as a whole. 6. England is already very crowded. Leaving aside small islands and city states, we are indeed the sixth most crowded country in the world after Bangladesh, Taiwan, South Korea, and (just) Lebanon and Rwanda. A list of population densities is contained in Annex A.